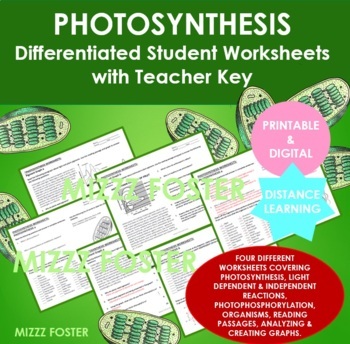 "Photosynthesis Differentiated Worksheets with Graphs and Key" contain four different worksheets. The first two review the importance of photosynthesis, the light dependent and independent reactions, chloroplast anatomy and photosynthetic organisms. The second set of worksheets covers the pigments with short reading articles and accompanying graphs for student to interpret and answer questions. 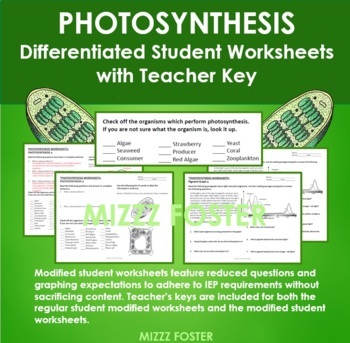 Both sets of worksheets have been modified for students with IEPs without sacrificing content. The type is also slightly larger. 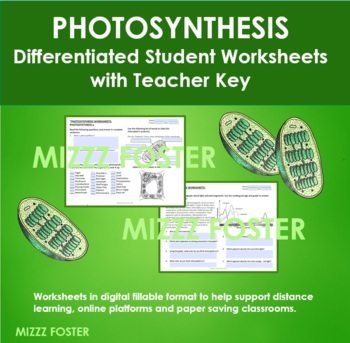 Both the regular student worksheets and modified worksheets have a teachers key. Copying the worksheets front and back ensures you only use two sheets of paper. 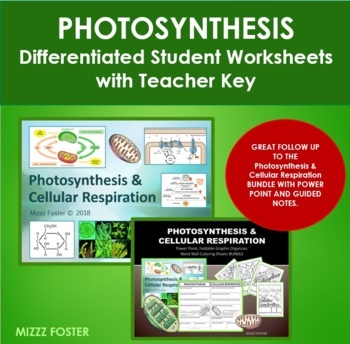 The worksheets are a great assessment for the Photosynthesis & Cellular Respiration bundle. The worksheets also work well as a review or sub lesson plans.